I left The UK more than twenty years ago. Not because I didn’t like it there, but because I had a Dutch girlfriend, the Maastricht treaty had just been signed and this interesting opportunity just came along. It wasn’t always easy, certainly dealing with the bureaucracy in the early years was complex and at times, less than a pleasure. But now, all that time later, I have absolutely no regrets. I have, for as much as it matters, dual nationality and I feel integrated into society. If you asked me if I feel more British than Dutch, then I would still say yes, I feel more British. Your formative years as a child, teenager and young adult, are it would seem, just that, very formative. Working in education it is a privilege to play your small part in helping steer young people through these influential years and giving them some extra baggage and vision as they step out into the adult world. At the school where I work we make great efforts in broadening the international perspectives of our pupils, helping them see and understand wider contexts. We organise trips abroad, exchanges with other countries and work experience placements that sometimes take the pupils quite literally to the other side of the world. This is my Dutch educational context, but there are educational institutions all over Europe working along the same lines. The message is very much, ‘the world is your oyster’. With this as background it is very easy to see why the younger voters in Britain have been so despondent about the result of the referendum. This week I have been asked so often for my thoughts on the whole Brexit debacle. I have watched from a distance with increasing disbelief. On Thursday night I was genuinely starting to believe that the remain campaign had done just enough. But no, headed by a group of opportunists behaving like secondhand car salesmen throwing their promises around a Pandora’s box has been levered open. What were the voters hoping that they discovered inside, a sort of nostalgic 1950s view of the country that never really existed? There is clearly a very long way to go in this complex situation, and it does seem apparent that the likes of Boris Johnson and Michael Gove might just be starting to realise just how complex. A poison chalice? Maybe, time will tell. This week, when I get back to school I will doubtless be asked again for a perspective as one of two token ‘Brits’ on the teaching staff. I will talk about my bafflement at the behaviour of the politicians and my feeling of despair at the outcome. But above all the insular, inward turned message it gives. The world is a complex place, with difficult issues on any numbers of levels. It needs and requires cooperation and understanding, not distancing yourself when the going gets tough. My teaching I hope reflects this stance. I want my pupils to feel engaged and that they have a place and a constructive relationship in the broader world. Maybe if you plough through the statistics there are reasons for hope, a more open minded youth vote may seem to suggest it. But departure from the EU restricts perspectives, limits choices and does little to help young people find their place and their voice in a broader world. I don’t want the opportunity that I had, and took, to belong to the past. It is no secret in education that a class at the start of the day is often a different proposition to a class at the end of the day. My timetable this year has thrown up, for me at least, one of the clearest examples of this that I’ve had in fifteen years of teaching. I thought about changing the name of the class to give them some anonymity, but let’s not, its V3S. They know who they are, they also know already that I see them as something of a schizophrenic bunch (in the nicest possible way of course!). I should perhaps start by saying that it is a class I like teaching a lot, twenty-seven fourteen and fifteen year olds. They are sociable, they are interested in more than just themselves, they are as a class really quite creative and able, and have a good feeling for humour. In fact, there haven’t been many classes that I’ve laughed so much with. All really enjoyable character traits for a class, especially for one that is actually built up of several quite distinctive ‘groups’, groups where the interaction between them is fairly modest. But having said all that, the difference in the mind-set of the class for my last lesson of the day on a Thursday afternoon and then when I see them again for the first lesson on Friday is regularly quite huge. Friday morning can feel like being in a public library, Thursday afternoon like teaching in a market place on a Saturday afternoon. It almost feels like I have two different classes, conscientious hard workers and a disorganised rabble. Part of my task as a teacher is obviously to try and ensure that in both modes V3S continue to be productive. Generally, I can achieve this, although if I was to stop to analyse it a carefully I’m sure I’d discover that more was being produced in that second lesson, but that has to be weighed against the verbal language production in the first one. I mention the verbal production point because as well as the art content of my lessons, verbal language production is also important. I am after all an art teacher teaching my lessons in English to help these Dutch pupils to develop and improve their English. With this in mind I am reluctant to impose silence in the classroom, especially when it is a class where we have carefully cultivated the use of English as being the absolute norm and the class has responded so well in playing their part in this. But oh, the chatter on a Thursday afternoon can at times be quite baffling. I recently complimented one of the boys for managing to talk continuously in English throughout the lesson, not straying into Dutch on a single occasion. He was, if I can be a little critical for a moment, talking absolute nonsense, and doing it nonstop for sixty minutes, but he was doing it in English! The factors that come together to produce this sort of apparently split personality class are varied, the timetable has thrown up art followed by physical education on a Thursday afternoon, this generates a sort of ‘release’ after a morning of more ‘academic’ lessons in the morning. They are perhaps a little tired, and when I see them again at 8.20 on a Friday morning dare I say that they are still a little dozy? All in all, it’s not too much of a big deal for me, however it does perhaps highlight the educational issue of good timetabling. Someone of course has to teach the difficult classes last thing on a Friday afternoon, just as long as they are not teaching the same group at the end of Wednesday and Thursday too! iPad education……two years in, and is it time for a new Apple purchase? With this as background extra courses for new teachers are being offered and an afternoon of workshops covering various useful apps and possibilities of the device will be on offer. Throughout the last two years I have been part of the iPad steering group that has been responsible for helping plan out the educational direction we are following with regard to this in-class form of digitalization. I think it is fair to say that I am an enthusiast, I lead workshops for colleagues, have followed the odd course myself, but above all have set out to try and work out how the iPad can be best used in my art lessons. As a result of my enthusiasm, the task of starting the school-wide study session In a couple of weeks has fallen to me! ‘You’ve always got I’m two years into my own adventure into iPad supported education. As a school where I work it’s nearly three years, first with a cautious pilot project and then an extension to the first year bilingual classes (where I teach) plus a couple more. That’s been the level for the last two years. But next year comes the big step, school wide in years one and two (12-14 year olds). Suddenly that’s a whole lot more pupils and perhaps more significantly, a whole lot more teaching staff! It’ll become more a case of who’s not involved rather than who is involved. such interesting things to show of what you’re doing with the iPad!’, says Albert my colleague, and iPad coordinator, in a suitably flattering sort of way. Hmm….thanks for that Albert! The brief is in ten to fifteen minutes to show my colleagues what I’m up to and what is possible with the device. …..this is starting to sound quite complicated! But perhaps the trickiest part is that the audience is, as is often the case in education land, quite a varied bunch. There are enthusiasts, like myself, who have already spent considerable time working out the options on offer. There are the beginners, who perhaps to need an enthusiastic presentation of some of the possibilities, as long as it doesn’t become too scarily complex! And then finally, there are the skeptics who, if I can paraphrase for a moment, think that we might be barking up the wrong educational tree. Whether or not we turn out to be heading up that wrong tree remains to be seen. Although I’ve seen enough in my subject area to be confident that this isn’t the case. It is a work in progress, a new form and approach to education. It shouldn’t come to control everything, but it certainly does offer some interesting and new possibilities. Control is a word that often seems to come up. Teachers understandably like to feel like they are in control of their classroom and maybe more importantly in control of the learning that is going on. Faces to the front and listen to the teacher offers a form of control on which education has relied for many a year. It sounds obvious, but that’s why the tables in most classrooms point in the same direction. Children facing one another does tend to create unnecessary distractions. Some will also say that having an iPad on the table in front of a pupils often does the same. The distraction issue, like the control one, has been a theme that has been a bit of a recurring one through our last couple of years of iPad experiments. Maybe as an art teacher I’m a bit less affected by it than most of my colleagues, but the level of interest and excitement that has met the new Apple Classroom app was a bit of an eye opener. Having been given a demonstration of the software it would seem that it may well ease the distraction issue and hand the control back to the teacher. Being able to control the functionality of the pupils’ device feels to me simultaneously attractive and dictatorial. I think the teaching staff will, in general, want to have this application. But I can’t help feeling that there is an irony here. We are all now equipped with these fantastic devices that can do so much, and that we have all bought from Apple. Now we are having to buy a new app, also from Apple, to limit them. Would we ever buy an additional product from a car manufacturer to limit the performance of a vehicle? An argument could certainly be made for a restricting device so that a car would stay within the speed limit? The question would be is it desirable, would it be acceptable? A slightly mischievous comparison perhaps but I think there is still a discussion to be had in school around some of these issues. Needless to say, the pupils aren’t particularly happy, but I’m sure they’ll cope, they do after all still have their phone in their pocket which we can’t limit. In the end it might all come down to money and costs. Apple know full well that an app of this kind is addressing an identified problem. They also know it can potentially be a big earner, and for us, a school where in a relatively short time 1000+ pupils will be working with an iPad, a relatively large cost. I like using my blog to showcase pupils’ work……..but…. ….if I’m going to do that, then it is only fair to show the occasional downside too. I would like to think that it is some strange sort of typo, but to be honest I don’t think so. 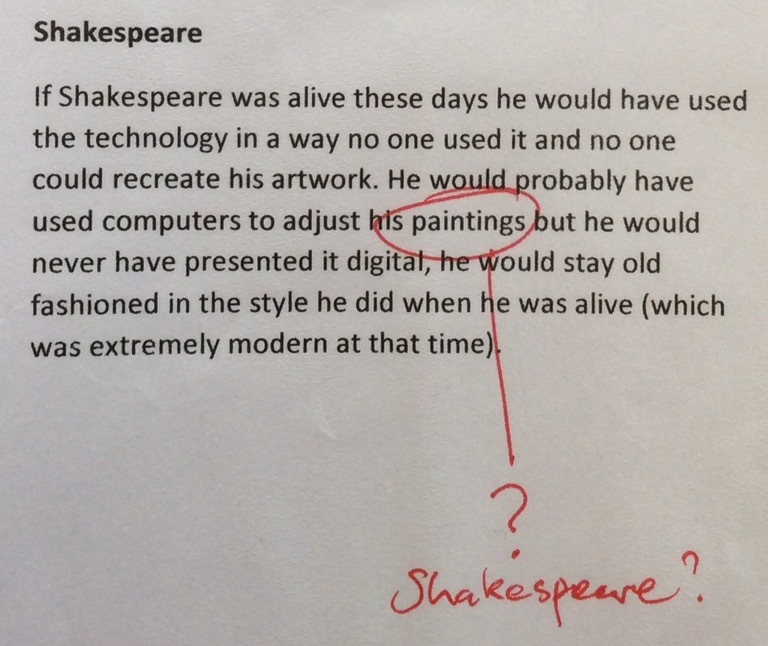 I thought we all knew which Shakespeare we were talking about, but maybe my pupil had a different one in mind. Work for both the art department and the English department here! I’m an art teacher, but I think this educational metaphor works pretty well across all subject areas, certainly within secondary education where I work, although I’m guessing also in higher education. Firstly, there are the ‘frozen pizza eaters’, they do anything and everything for convenience. The frozen pizza is a meal of sorts, it fits on a plate, it has appropriate shapes and colours, some pupils would say that it fits the requirements. But from my perspective it’s two dimensional and kind of always tastes the same. And these are just the sorts of school assignments that these pupils hand in, it looks like a report, it has the right superficial appearance, but it lacks depth. It is in all regards the easy route and one that as a teacher I want to get beyond. Then there is a second group, those who rely on the book, the recipe book. They follow it with enormous care. Measuring carefully, working through the step by step instructions and often in the end they have a beautiful produced result/meal, or in the educational scenario, a piece of work. However, there is an important detail that they forget, they never taste their cooking as they go along. A third group follow exactly the same route as the second, however, they do taste the cooking, make adjustments and add seasoning as required. It’s a small but oh so important detail, for this makes it a reflective process, they are remaining critical throughout the process, alert to what they are doing, aware that fine tuning Is important and that they have an important part to play themselves. In terms of education processes self-reflection and critical evaluation are vital, as is reacting to these sorts of observation. This is how an assignment can be made their own, and operate as part of an engaged process of learning. There is a fourth group too. Perhaps not the easiest group for the teacher, but ultimately the most exciting. They are the ones who take a look at the recipe book, read the instructions, close the book and go and go and look what they have in the cupboard. They are the risk takers; they are the creative spirits. They can produce truly surprising, unexpected delights, they can also fail dreadfully. In culinary terms they are the ones who ultimately leave the instructions of the recipe books behind. They are interested in flavours and ingredients and what they can do with them. They too, like the third group, are engaged with the process. They have truly made it their own. A class full of the creative radicals that are the fourth group would be an extreme and exciting place to teach. But these pupils are very much the exception to the rule. Although the third group does seem to be quite different to the last, maybe it is actually not a bad second choice to hope for. Engaged and critical are characteristics in our students that need to be nurtured and encouraged. In an educational system dominated by testing, there would seem to be an inherent risk of an over-reliance on the book and simple reproduction skills are perhaps too heavily rewarded. Reproduction is perhaps a first step, but it’s insight and understanding that are the crucial steps further. 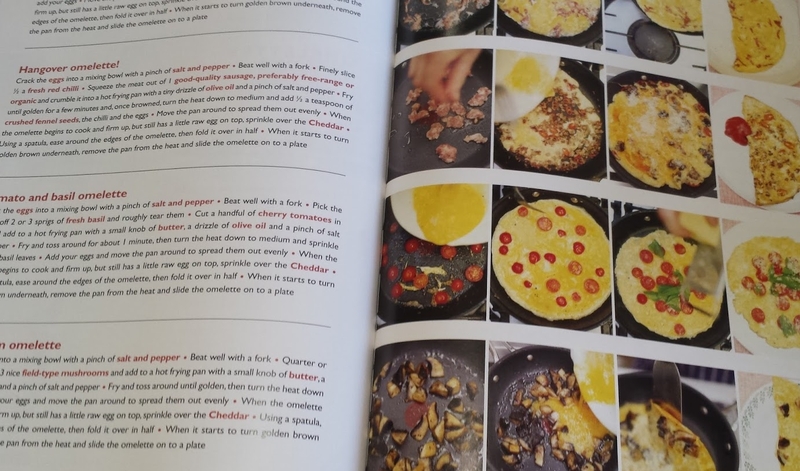 In my kitchen metaphor it is important that pupils and students are given the encouragement to taste their own products and the confidence to make the necessary adjustments. Such a critical edge is an important stage towards the creative attitudes that we need to be developing across the board in education to fit into our modern and ever changing world.